When I saw this dress on the rack in Forever 21 Megamall (only one of two left!) and it was in my size, I quickly snatched it up and tried it on. The stretchy fabric clung to the right places, the belt accentuated my waist, the scoop neck was just at the perfect depth and I fell in love right there and then. Love at first fit. Sigh. I wore this to a debut of a family friend. I didn't have a grand coming-out party like she did with over a hundred and fifty guests and a live band. My parents just invited my closest friends and we had a fancy hotel dinner to celebrate my 18th birthday. I didn't even dress up because I literally didn't have a dress. Do you still remember your 18th birthday and how you celebrated it? oh yes the dress fits perfectly :) thank you so much for all your sweet comments too <3 i got the jacket recently enough at F21 in stores (couldn't find it online) so you might still be able to find one! and the camera i use is the nikon d60 :) if i were able to afford it, id upgrade to the nikon d90! I'm looking to get a new camera, so I'll check out the prices when I go to the mall and see which one my pocket can afford. Haha! Thank you so much for sharing! oh yes and i did a lot of research and found the best lens are 35 mm, 50 mm, and 85 mm. the prices range from $140, $550, $1200 and so i settled on the 50 mm. it makes a HUGE difference! Thanks Heather! I love it too! Love the primary colored dress! 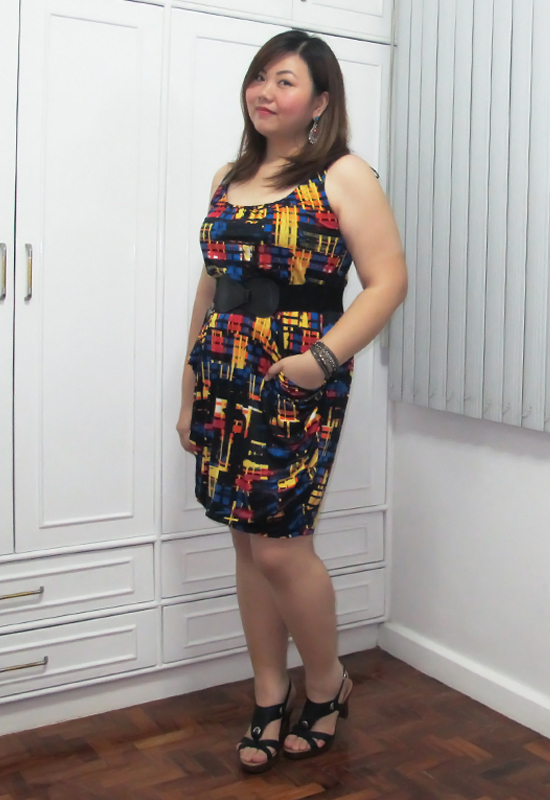 Girl, you are rocking this dress! Love the color and print on it. Definitely hugs the right places haha. Thank you! The curves are loving it! The dress is absolutely beautiful! You look lovely dear! I love when things like this happen, usually the thing I want is never in my size. love the print. Oh no! Locked in at 18! Haha! What a pretty dress! Love the colors and pattern :) Looks great with those shoes. Nice shoes are hard to come by for a size 10W and I was lucky to find these in the mall. :) Thanks Megan! pretty dress, I love bold prints. Fits you like a glove, too! Great find. Hello! 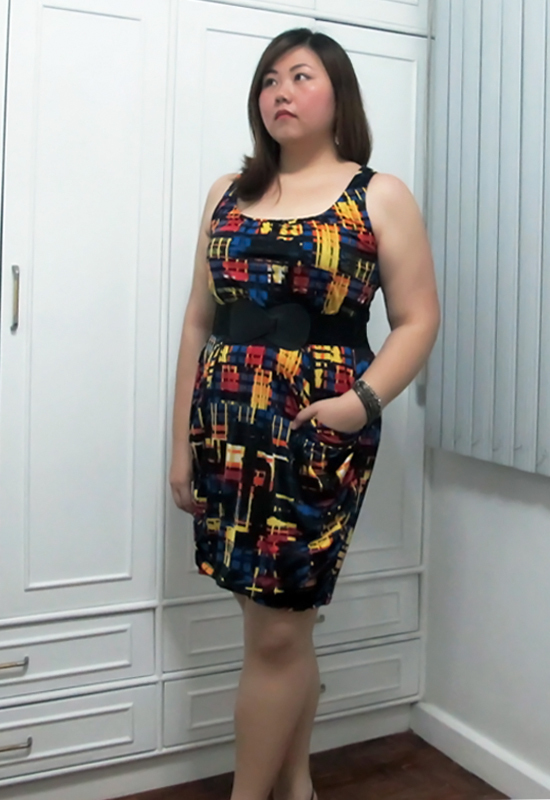 thank you for stopping by my blog:) You look wonderful in this dress. I don't know where that is. Haha! Medyo taong-bahay kasi ako eh, but I looove going through sales and bazaars so maybe I should try thrifting too! Galing mo nga eh, I saw your picks and they're so good! I like the graphic design on the dress. It also fits you. Thanks for dropping by my blog. =) Hope you visit often. the dress fits you perfectly! i want one too! haha.. its very versatile.. something you can wear on a regular day, at work or at a party.. good find! My parents hosted a luau party and we had everyone in their colorful and flowery outfits. I miss being 18 again. Btw, beautiful and dress is well-fit, you look fab!